Silly season is upon us! As evidenced by the often ridiculous flight prices, December is a very busy travel month for both domestic and international flights. It is a great time to visit friends and family or simply indulge in summer activities. The school holidays start on the 13th of December 2018 and the 16th is a public holiday, the Day of Reconciliation. 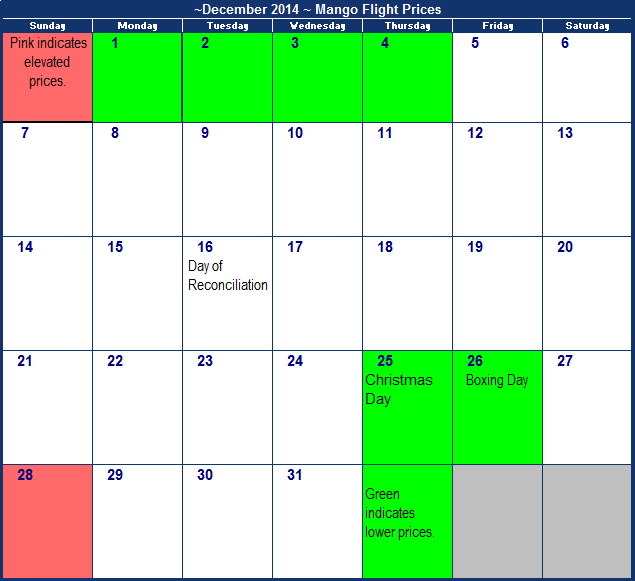 Therefore flight prices are particularly expensive over that weekend as many start their festive break. Many landlocked families choose to make use of this time to see the ocean, hence a dramatic increase on flight prices between Johannesburg and Durban and between Bloemfontein and Cape Town. Depending on the route you wish to travel on, affordable flights can generally be found toward the beginning and the end of the month. See below the breakdown of flight prices per route. Mango Joburg to Cape Town : Avoid flying towards the end of the week, as those flights are by far the most expensive. Mango Cape Town to Joburg : For a bargain you'll want to travel on the 124th and 25th of December. 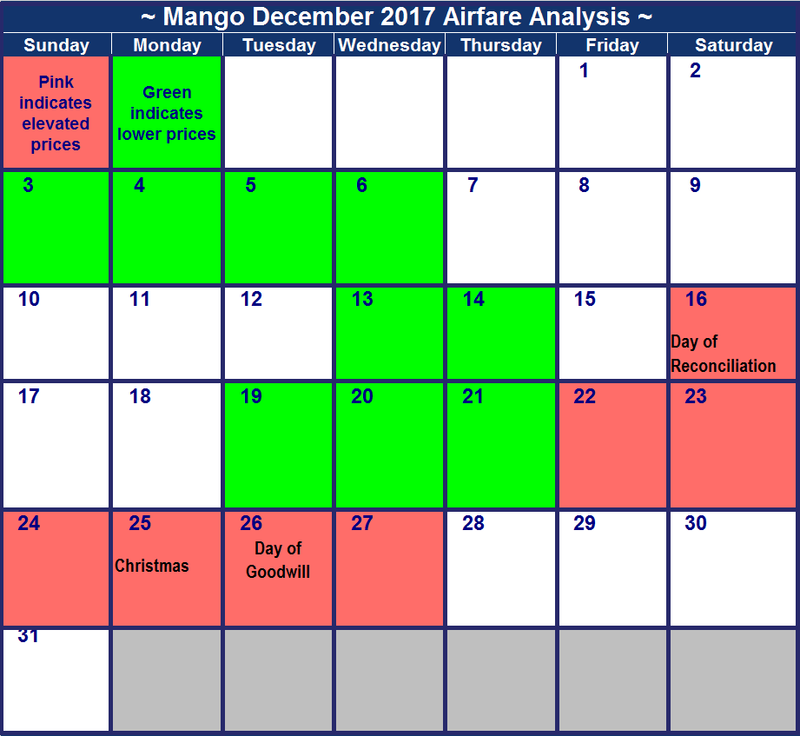 Mango Lanseria to Cape Town : If you have to be in Cape Town during December then try to fly towards the end of the month. Mango Cape Town to Lanseria : Flight prices are fairly consistent throughout, but budget conscious travellers should avoid the weekends where possible. Mango Joburg to Durban : Prices on this route are relatively affordable throughout, with only four travel dates to avoid. Mango Durban to Joburg: Flight prices remain fairly consistent throughout the month, with only slight increases on weekend flights. Mango Cape Town to Bloem : Travellers on a tight budget are going to struggle finding affordable flights on this route, but should avoid the most expensive travel dates highlighted in pink. Mango Bloem to Cape Town : Where possible, travellers should avoid flying on Fridays and Sundays. Mango Joburg to George : If you're on a tight budget, you might have to end the year on a high note (literally!) and take a flight on the 31st of December. Mango George to Joburg : Avoid travelling during the last week of the month where possible as flights are fairly expensive. Mango Cape Town to Durban : Book your flight on the 1st or 25th of December if you still want some savings left over. Mango Durban to Cape Town : Budget conscious travellers should avoid travellling on Saturdays where possible. Mango Joburg to Port Elizabeth : The difference between the cheapest and most expensive flight of about R1000 is enough to cover a return flight! Mango Port Elizabeth to Joburg : Budget conscious travellers should avoid travelling on the 15th and 29th of December 2018 where possible. *Pricelist was compiled on the 26th of November 2018 from the Mango website. December is the busiest domestic travel reason for good reason. Not only does it mark the start of summer in the Southern hemisphere, it is also the festive season! Many choose to visit friends and family during the school holidays, which start on the 6th of December 2017. Most offices also close between Christmas and New Year, with some closing as early as the 16th of December (Day of Reconcilliation). Most landlocked families choose to make use of this time to see the ocean, hence a dramatic increase on flight prices from Johannesburg to Durban and Cape Town. If you are travelling on a budget, you'll find the most affordable flights during the first two weeks of the month before the wordforce go on annual leave from the 16th of December 2017. Mango Joburg to Cape Town : Avoid flying on the 23rd, as it is the most expensive day to travel on. Mango Cape Town to Joburg : For a bargain you'll want to travel on the 13th, 14th, 19th and the 20th. Mango Lanseria to Cape Town : If you have to be in Cape Town during December then try to go during the first week of the month. Mango Cape Town to Lanseria : Flight prices increase drastically from the third week of December. Budget-conscious travellers would be best off to travel on the 6th or 7th of December 2017. Mango Joburg to Durban : Prices on this route are relatively affordable throughout, with only a slight increase on the 23rd. The cheapest flights by far can be found at the beginning of the second week. Mango Durban to Joburg: Flight prices remain fairly consistent throughout the month. Mango Cape Town to Bloem : Avoid travelling on dates highlighted in pink where possible as flights are fairly expensive on these routes. Mango Bloem to Cape Town : Prices are very similar to the Cape Town to Bloemfontein route. If possible, avoid travelling on the 8th of December 2017. Mango Joburg to George : If your on a tight budget, you might have to end the year on a high note (literally!) and take a flight on the 31st of December. Mango George to Joburg : As with most routes, the cheapest flights are found during the first two weeks of the month. Mango Cape Town to Durban : Book your flight on the 5th of December and still have some spending money for the rest of the holiday left. Mango Durban to Cape Town : Flight prices are elevated throughout the month, with the cheapest flight available on the 4th. Mango Joburg to Port Elizabeth : Surprisingly the 31st is the cheapest date to travel, so make sure to book your New Years Eve flight as soon as possible. Mango Port Elizabeth to Joburg : Where possible avoid travelling on the 30th of December as that is the most expensive travel date. It is not too late to secure affordable flights this holiday season! Surprisingly we were able to find ample affordable flights after the 16th of December 2016, when flight prices traditionally start to increase significantly. If you are travelling on a budget, avoid Friday and Sunday flights in general as those days are the most expensive to travel on this month. In general the first two weeks are also slightly cheaper to travel on. If you are looking for school holiday flights, best book now as flights from the 7th haven't yet increased in price. Budget travellers should avoid travelling on 9th, 11th, 16th, 18th and 23rd of December 2016 where possible. We are sure that dates surrounding and after Christmas would soon be added to the list. In general, flights to Johannesburg (OR Tambo and Lanseria) are the cheapest this December. Mango Joburg to Cape Town : Avoid flying on the 11th, as it is the most expensive day to travel on. Mango Cape Town to Joburg : Flight prices around Christmas are very competitive, but for a real bargain you'll want to travel during the first week of the month. Flight prices are the cheapest on the 1st, 5th, 6th, 7th and the 8th. Mango Lanseria to Cape Town : If you have to be in Cape Town during December then try to go during the first week of the month. Make sure to book flights for the 1st and the 3rd, as those are the cheapest prices. Mango Cape Town to Lanseria : Prices on this route are very competitive throughout the month. Make sure to travel during the first week of the month. The most affordable flights are on the 1st, 3rd, 6th, 7th and the 8th. Mango Joburg to Durban : Prices on this route are affordable throughout the month. Book to travel on the on 8th to get the cheapest price. Mango Durban to Joburg: Prices on this route are affordable throughout the month. Avoid travelling on the 16th, when prices are slightly inflated. Mango Cape Town to Bloem : Flight prices are very expensive on this route. If possible travel on the 1st and the 6th. Mango Bloem to Cape Town: Prices are very similar to the Cape Town to Bloemfontein route. You will find the cheapest flights on the 1st and the 25th. Mango Joburg to George : Flight prices are very expensive on this route. You will find the cheapest flight on the 5th. Mango George to Joburg : Make sure to travel during the first two weeks of the month for affordable prices. The cheapest price is on the 12th. Mango Cape Town to Durban : You will have more to spend during the festive season if you travel during the first three days of every week, starting from the second week. Avoid travelling on the 11th, 16th and the 18th. Mango Durban to Cape Town : Snap up those cheap airfares around the first week of the month. You will find the cheapest prices on the 1st, 5th, 6th and the 7th. Mango Joburg to Port Elizabeth : You will find the cheapest prices for this route on the 1st, 3rd, 4th, 5th, 6th, 7th and the 8th. Surprisingly the 31st is one of the cheapest dates to travel, so make sure to book your New Years Eve flight as soon as possible. Mango Port Elizabeth to Joburg : Travelling from Port Elizabeth is expensive. Grab the cheapest flights on the 5th, 7th, 8th and the 14th. Flights during December are notoriously expensive, but this survey proves that if you book early enough you could pocket some massive savings! Flights around Christmas haven't even peaked yet, although they usually do. The only dates you should definitely avoid is the last few dates of the month. In particular the 29th seems to be a very expensive travel date on most routes. If you want to find cheap flights, you should look to dates in the first week of the month. But hurry as we expect these prices to sky rocket soon! Prices were checked on the 26th of August 2015. The more time that has passed since this date, the likelier that they would have changed. We can't guarantee these prices. Mango Joburg to Cape Town : Avoid flying on the 10th and 29th as these dates have the most expensive airfares. Mango Cape Town to Joburg : Flight prices around Christmas are very competitive, but for a real bargain you'll want to travel during the first two weeks of the month. Mango Cape Town to Lanseria : Prices on this route are very competitive throughout the month. Just avoid travelling on the 1st of December. Mango Joburg to Durban : Prices on this route are very competitive throughout the month. Mango Durban to Joburg: Avoid travelling on the 29th if possible. Mango Cape Town to Bloem : Flight prices are very expensive on this route. If possible travel on the first three days of the month. Mango Bloem to Cape Town: Prices are very similar to the Cape Town to Bloemfontein route. Mango Joburg to George : If possible, travel on the 6th which is by far the cheapest date to travel on. Mango George to Joburg : Avoid travelling on the 28th and 30th where possible. Rather travel during the third week of the month. Mango Cape Town to Durban : It could cost you up to double the cheapest airfare if you travel on the 24th or 29th. Mango Durban to Cape Town : Snap up those cheap airfares around Christmas as soon as possible! Those won't last long. Mango Joburg to Port Elizabeth : Once again the 19th is the most exspensive date to travel on. Mango Port Elizabeth to Joburg : Flights are consistantly affordable throughout the month, so take your pick! As you might think, December is a popular month for flights, with the school and university holidays, Christmas Holidays and New Year’s celebrations all happening in the festive month of December. The demand for flights are highest around the public holidays on the 16th, 25th and 26th of the month. Flight prices spike from the 10th onwards as that is when school holidays start. If you're looking to book flights around the Christmas day then you better book early as seats are filling up quickly. All airfares that are listed below were the cheapest we found on each day during the month of December 2014.This survey was done on the the 12th of September 2014. Please note that airfares might have changed by the time you read this. For more up to date airfares head to the Mango site. Mango Joburg to Cape Town : Avoid flying on the 12th and 19th as these dates have the most expensive airfares. 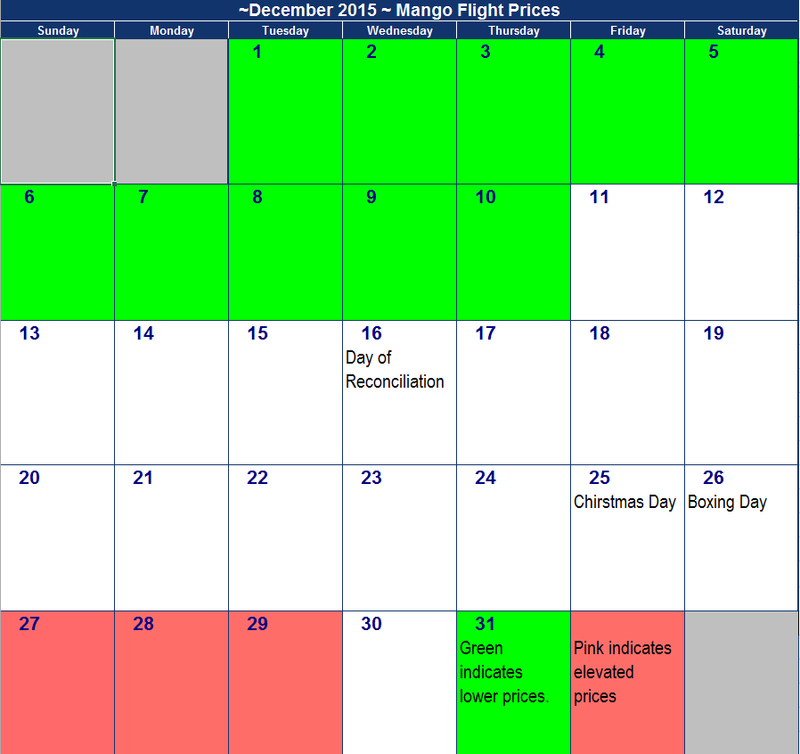 Mango Cape Town to Joburg : Flight prices around Christmas are very competitive. Mango Cape Town to Lanseria : Prices on this route are very competitive especially during the start of the month. Mango Joburg to Durban :The 7th, 17th, 18th, 20th, 22nd, 25th, and 28th have the lowest prices. Mango Durban to Joburg: There are flights available at the low price of R696 all through December. Mango Cape Town to Bloem : Flight prices are very much up and down on this route, try to fly during the middle of the week as the airfares are the lowest during that time. Mango Bloem to Cape Town: If you want ot be in Cape Town for Christmas day then fly on the 24th as the price is very competitive. Mango Joburg to George : Airfares on this route are very high, try to avoid flying in the middle of the month. 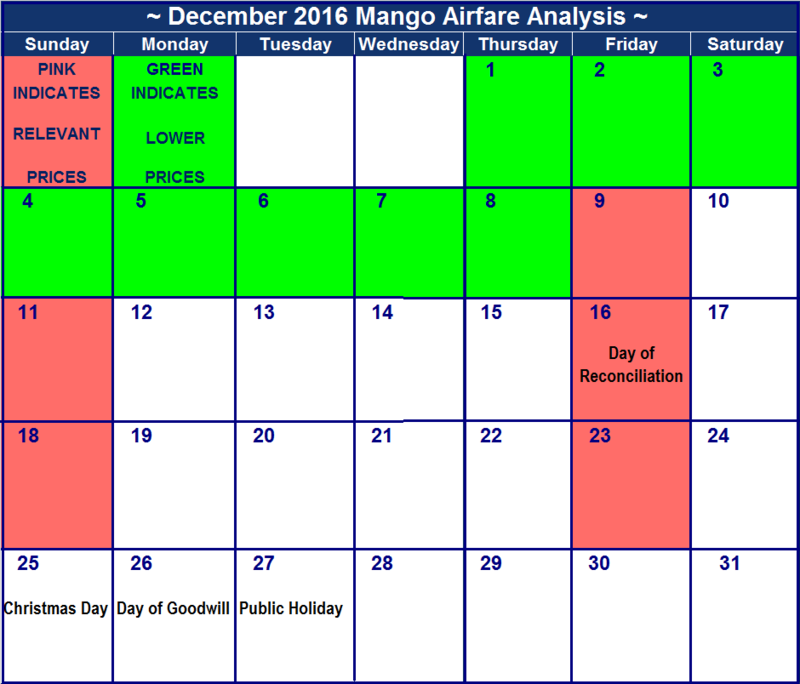 Mango George to Joburg : The airfares are very high during the final week of the month, rather fly back in January. Mango Cape Town to Durban : No problem finding cheap airfares on this route, take your pick. 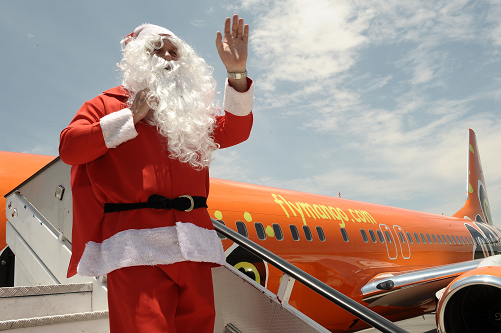 Mango Durban to Cape Town : Flight prices around Christmas are very high. Mango Joburg to Port Elizabeth : The most common price on this route is R1165, not a bad price for JHB to CPT. Mango Port Elizabeth to Joburg : If you're looking at going to JHB for a quick Christmas break then flight on the 24th and 27th will suite you.